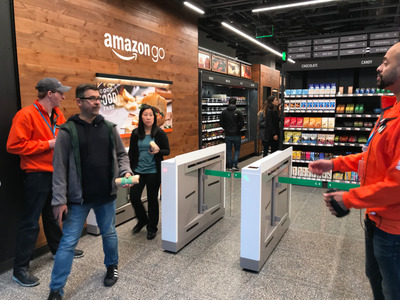 Amazon opened its first cashier-less Amazon Go store in San Francisco this week and it’s located in the Financial District at 300 California Street. 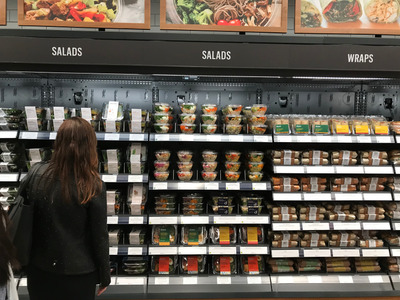 The store is pretty much a modern corner store – complete with candy, frozen pizzas, and chips -along with some fresh pre-packaged lunch options. Amazon’s “Just Walk Out” technology worked seamlessly in our experience, though first-time shoppers can be a bit hesitant upon exiting. Employees are excited about the future of the store and say that even without cashiers, there’s plenty of work to be done. 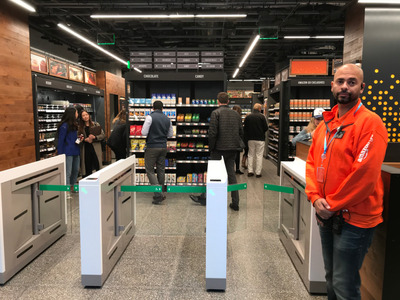 On Tuesday, the cashier-less Amazon Go store opened in San Francisco. Amazon Go is the company’s vision for the future of shopping. The store uses cameras, sensors and other technology to track the goods you pick off the shelves and automatically charges it to your account when you walk out. No waiting in line. 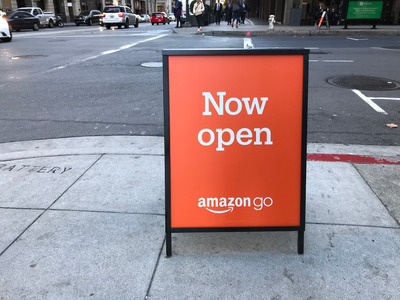 Amazon opened its first Go store in its hometown of Seattle in 2016. There’s one in Chicago. And now it’s expanding to San Francisco. 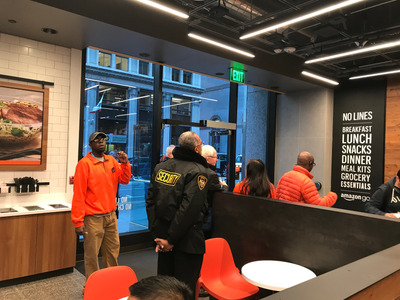 We stopped by the new store at 300 California Street to grab a sandwich and see what Amazon’s “Just Walk Out” shopping experience was like. 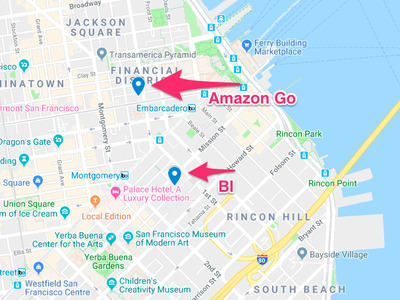 Amazon Go’s first San Francisco store is located smack in the middle of the city’s financial district — and, as luck would have it, just a few blocks from the Business Insider office. The store, which is open from 7am to 9pm Monday through Friday, seems aimed at the office worker crowd; Busy, time-pressed desk-jockeys looking to gab a quick bite or a juice on their way in, or out, of the office. 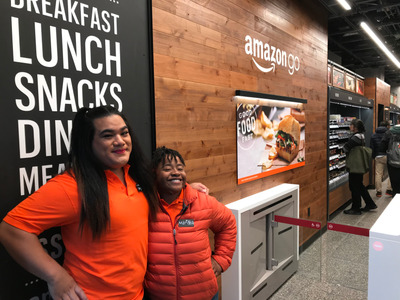 At 2,300 square feet, this Amazon Go store is cast in the mould of your average 7-11, rather than a supermarket, when it comes to size. 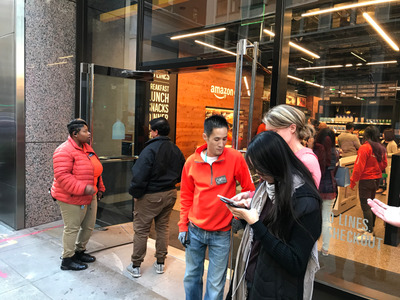 Before entering the store, customers were prompted to download the Amazon Go app, which created some congestion and confusion outside. Employees we spoke to said that downloading the app had been the biggest pain point of the day. People forget their passwords. Others frantically tried to get ahold of their spouses to log in to their accounts. I failed the reCAPTCHA test twice but eventually got it downloaded. Without the Amazon Go app, you are not able to get past the sensor gates to start shopping. There’s a QR code in the app. You flash the code on your phone’s screen in front of the sensor, as with an electronic plane ticket, and voila – the gates open. Once inside, you soon realise the store is pretty much a modern corner store with some local options. There’s candy, frozen pizzas, and chips. For elevated taste buds, there’s expensive beef jerky, La Croix, and a refrigerated wall full of fresh sandwiches, salads, and sushi. The San Francisco location is the first to have sushi, an Amazon spokesperson told me. There’s no booze sold at this location and no brewed coffee. Another employee told me that if I wanted fresh coffee, I could make that request within the app and the company would consider it in the future. For food, I abandoned my sandwich idea when I saw a pre-packaged wrap from dosa by Dosa – an Indian restaurant that has a few locations in the San Francisco Bay Area. It was a Bombay Potato Street Wrap for the record. One employee told me that if I wasn’t pleased with my food, I could request a refund directly from the app – no questions asked and no need to come back into the store to return it. Most shoppers just wanted to experience what Amazon calls its “Just Walk Out” technology. 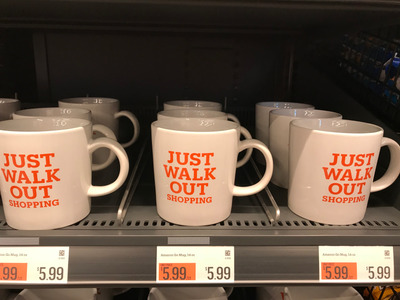 Perhaps that’s why these “Just Walk Out” mugs were at the front of the store. Like a kid standing at the edge of a diving board, many shoppers needed some prodding to take the leap and walk out without handing anyone any money. The technology worked perfectly for me, though. I simply walked out, checked my Amazon App, and saw that I was charged for one Bombay Potato Street Wrap. I even went back in through the gates a second time with wrap in-hand and exited. When I checked the receipts in my app, there was record of my visit but no record of me being double charged. An Amazon spokesperson told me that’s because its proprietary computer and sensor vision tracks when you pull an item off the shelf, rather than scanning what you have in-hand when exiting. The Amazon Go staff was extremely helpful and optimistic about the future of the store. Even without the cashier position, employees told me there’s plenty of work to be done. One person told me that the checkout technology allows them to spend more time on the floor, assisting customers and pointing them in the right direction. Another said if an item is put back in the wrong place (like when you put your coconut water back where Icelandic skyr should be), employees are alerted and will return the item to its proper home. 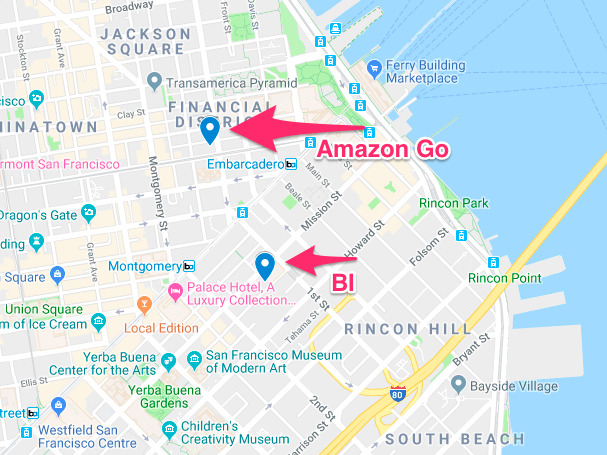 There were way more Amazon Go employees in orange shirts than the typical convenience store – probably at least 20 when I was there on Tuesday. It will be interesting to see how many employees are on the floor once customers have their apps downloaded and are comfortable just walking out. There was one security guard onsite, even though you can’t really steal anything. I asked the security guard about his job. He told me his primary duty was to keep homeless people out of the front section of the store where there are tables for customers to sit and eat.